The Deane Stahmann scholarship was established in 2008 to provide Australian pecan growers and industry participants with the opportunity to attend the Texas Pecan Growers Short Course at Texas A & M University. The course gives access to extensive American research and expertise on the planning, establishment, management and marketing of pecans. The scholarship is offered biennially. 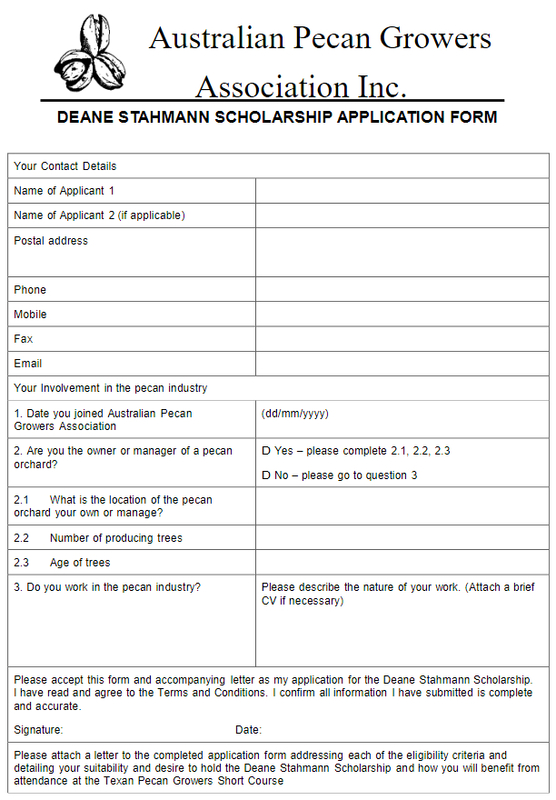 The winner of this scholarship is asked to produce a short paper outlining observations and experiences for presentation at the Australian Pecan Growers Association Annual General Meeting and suitable for inclusion in the Australian Pecan Growers Association Newsletter/Website. Deane Stahmann is considered the “father” of the Australian pecan industry. He came to Australia from the family pecan farm in New Mexico, USA, in 1965 with the intention of creating the first commercial pecan operation in the Southern Hemisphere. He planted the first Pecan trees at Gatton in Queensland, and shortly after at the flagship property ‘Trawalla’ near Moree in New South Wales. At Trawalla more than 70,000 pecan trees were established on 1,800 acres of rich, alluvial soil on the Moree plain – production at that property now yields as much as 3,000 tonnes of nuts each year. The business he created “Stahmann Farms” encompasses the pecan farms and processing facilities for pecans and macadamias at Toowoomba. In 2008, Deane Stahmann passed the baton of Stahmann Farms to new owners and what better way to commemorate his enormous contribution to the Australian pecan industry than the establishment of a scholarship which seeks to create the next generation of pecan growers and managers in Australia. The Australian Pecan Growers Association is the national representative body for pecan growers and processors. 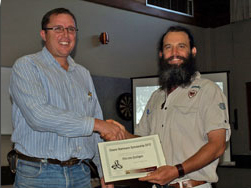 The Association is committed to the future of the pecan industry in Australia. By supporting members to expand their knowledge and skill base through attendance at the Pecan Growers Short Course the Association will enhance the capacity of the industry to grow. Applications will be considered from individuals, partners and farming families; for example two co-owners of a pecan orchard could apply to attend the same course. However only one scholarship will be awarded per application. Details on when the next scholarship will be awarded will be posted hear soon. Download and complete the Deane Stahmann Scholarship Application Form and provide a supporting letter addressing the eligibility criteria. Deane Stahmann Scholarship, c/o Dawn Thornton, PO Box 265, Bowraville, NSW, 2449 or emailed to bellbowra@bordernet.com.au. Queries can be directed to Dawn Thornton at the above contact details or 02 6564 8747.